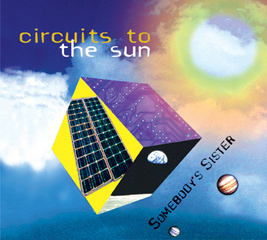 Also co-led by the prolific Ken Selcer, along with Jill Stern, is the pop rock group SOMEBODY'S SISTER: "Circuits to the Sun" (www.kenselcer.com). My question is, why can't mainstream music sound more like this? While definitely pop music, it's such a higher quality than just about anything one can hear on the top radio stations. It's like SS refused to take the easy and dumbed-down route. The songs are catchy without being screechy (lClarkson), melodically all over the map (Aguilera), or just pretending to be on key (Spears). Plus Ken and Jill's voices are so well suited for the sound that, in a more fair world, it would be SS on the charts, making listenable pop. Highlights include "Dancin' Wild" (regular and extended mixes) and "Dirty Little Secrets".